MANILA, Philippines - Boy bands Super Junior, SHINee and FT Island held their various concerts over the weekend in Korea, Japan and Taiwan. After touring seven countries, Super Junior ended their Super Show 4 world tour on May 26 and 27 with encore concerts at the Olympic Gymnastics Arena in Seoul. It was the same arena where the boy band kicked off the concert in November last year. Since then, Super Junior has toured Japan, China, Taiwan, Singapore, Thailand, France and Indonesia. During the concert, leader Leeteuk said they are now working on their sixth album, which will be released before he enlists in the Korean military. No other details of the album’s release date or Leeteuk's enlistment were announced. Fans are hoping that Kangin, who was discharged from the military last April, would participate in the album. Currently, Super Junior member Heechul is serving the military since September last year. On the other hand, the "Play! FT Island in Taiwan" concert was held over the weekend. "With Taiwan fans fantastic event and enthusiastic support FTISLAND members could enjoy the concert. FTISLAND was really moved by your lovely event!!! Once again thank you so much for your gorgeous event and please show us your everlasting love," FT Island posted on their official Facebook page. FT Island is popular in Taiwan. 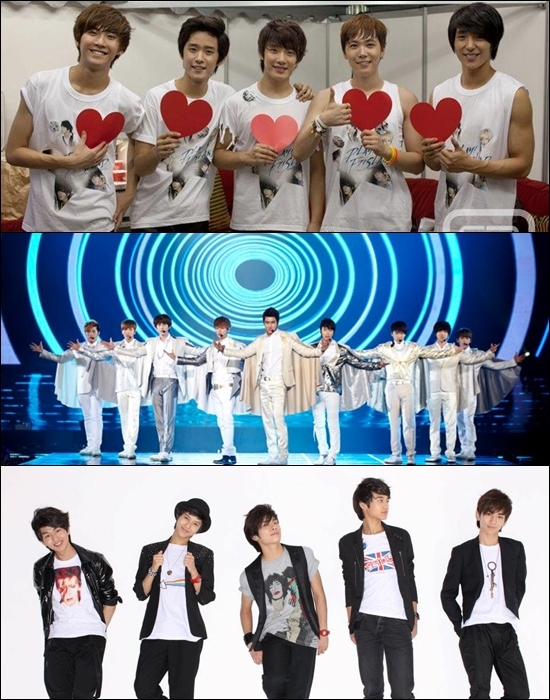 The boy band's fourth Korean mini-album "Grown-Up," released earlier this year, topped nine charts in Taiwan. FT Island also released their new Japanese album "20 (Twenty)" last May 16, which debuted at No. 3 on the Oricon chart. It sold 41,726 copies in its first week to place fourth overall on the chart. The album also placed fourth on Billboard Japan's Top Albums chart. The boy band is set to hold their "FT Island Summer Tour 2012" in June and July. Boy band SHINee also held their "The First Japan Arena Tour" in Osaka also over the weekend. The tour also coincided with the release of SHINee's fourth Japanese single "Sherlock." The song debuted at No. 2 on Oricon's daily singles chart and also placed at No. 2 on the weekly singles chart, selling a total of 48,990 copies. SHINee will continue to tour Japan until July.